A fellow Family Tree DNA member emailed me asking about an Andrew Sass that may have arrived with his known relative with the surname Nowak. For my convenience and to protect his privacy, I’ll use the initials SW to indicate this contact. SW had tested with his sister and I had submitted a test for my mother. Both of us are exploring our Polish heritage. Family Tree DNA is predicting that we are 3rd to 5th cousins. SW asked whether Andrew Sass and Louise Sass could have been siblings. It is possible. In my previous research using Polish church records on Family History Center microfilm, I found the church baptism index for Louise. I unfortunately have not found the actual baptism register that the index listed. I made note of the other Sass entries in the index, including an Andreas Sas, baptized 17 Aug 1894, and 7 other Sas babies baptized between 1880 and 1896. My research plan into whether Louise Sass, who was baptized 22 Jun 1889 and emigrated 27 Apr 1907, is related to Andrew Sas, as described by SW, and whether this Andrew Sass is the same person as the Andreas Sas who was baptized on 17 Aug 1894 includes researching Chicago and Polish church records available as protected digital images at FamilySearch affiliated libraries. o St. Barbara Catholic Church, Chicago, IL. I just need to find the time for a field trip to a Family Search affiliated library. I like the Fountaindale Public Library in Bolingbrook, IL. The building design allows in a lot of natural light, they provide large tables, and have consistently strong Wi-Fi. 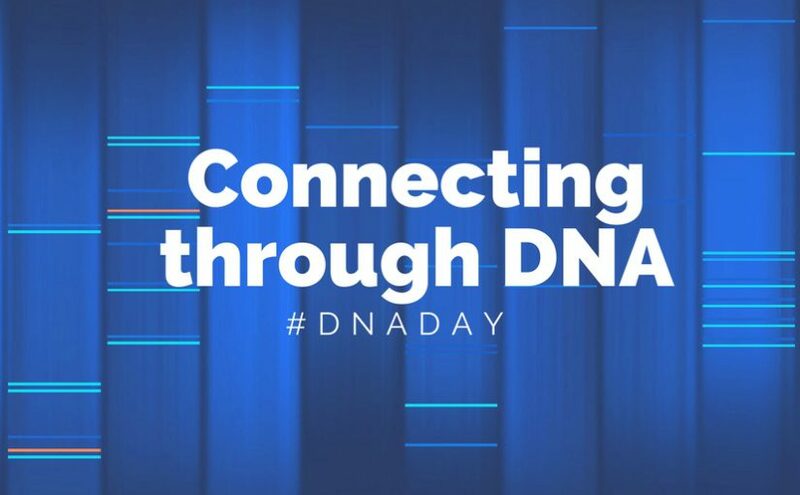 So, thank you DNA for the connection. 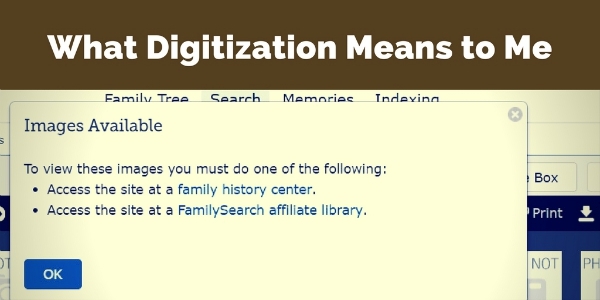 When reading about the “Family History Microfilm Discontinuation,” I had mixed thoughts. I loved the progress LDS has made on digitizing the microfilm in its collection, but I was concerned that the Polish records that I was concerned that these records may not be a priority. Today, I took a moment to review the films for Pilzno and Konin Poland. The good news is that these films are 89% and 79% digitized, respectively. I was surprised and thrilled. I was already putting a research plan together in my head. I went through all the films and saw the same or similar messages. So while the images are available, they are not yet available on my home computer. One group of records, Poland, Tarnow Roman Catholic Diocese Church Books, is available as an index of over 1 million records. So for a few of the Pilzno records, I can use the index as a starting point, but I will want to view the images to see what was indexed. I am fortunate in that I have two locations near me where I should be able to view these images. Does anyone have any idea why the naturalization numbers and names mentioned in an index wouldn’t match with the names and numbers on the naturalization petition images? Are there different numbering systems? I started with the tip sheet (1) that Rosanna Hogarty posted to the Chicago Genealogy page on Facebook. The tip sheet was clear and organized well. And, I was excited to jump right into the search. But, I was puzzled that for two out of three of my Polish great grandparents that I found in the index, the numbers listed on the index card led me to a petition for a different person. First, the one that matched. Louisa Smasz’ record in the index (2) did match the record the petition (3). It was also easy to find using the tips provided by Hogarty. While I found an index record for Louisa Smasz’ husband, Piotr, the name on the petition did not match. Piotr’s index card (4) listed number P.56992, but the application with number P. 56992 (5) belonged to someone named John Silinskas. The doubly strange part of this is that I have a copy of Piotr Smasz’ petition number P. 56992 (6) that was included in a packet from the U.S. Citizenship and Immigration Services FOIA request response. The “best reproducible copy” may not be the best, but the petition number and name are readable in the paper copy and match Peter Smasz’ index card. Unfortunately, I couldn’t produce a readable image to share in the blog. Similarly, Vincent Szubinski’s index card (7) listed number P.69199, but the application with number P.69199 (8) belonged to a person named Erik Hugo Peterson. I also have a copy of Vincent Szubinski’s petition from the USCIS Genealogy Program (9) that does match his index card and is clear enough to share here. I did try browsing the petition images by the petition date instead of petition number, but didn’t find Piotr’s or Vincent’s peitions in the online images. I noticed when comparing the FamilySearch images to the USCIS copies that the image of the naturalization petitions available through FamilySearch are original copies while the copies of naturalization petitions available from the USCIS Genealogy Program are duplicate copies. The USCIS Genealogy Program uses indices unlike any immigration or naturalization index available to the public. Our unique Master Index system is a combination of index tools—partially automated and partially manual—that work together to identify and locate old agency files and records. I would love to hear from anyone who knows why this discrepancy is happening or from anyone experiencing similar challenges. The lesson is to not give up, even if you don’t find the records where you think you should. 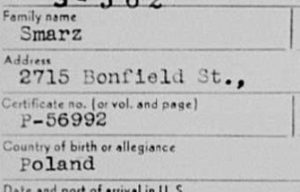 (2) “Illinois, Northern District Naturalization Index, 1840-1950,” database with images, FamilySearch (https://familysearch.org/ark:/61903/1:1:XKPS-4HT : accessed 7 April 2016), Ludwika Smarz, 1941; citing Chicago, Illinois, NARA microfilm publication M1285 (Washington D.C.: National Archives and Records Administration, n.d.), roll 164; FHL microfilm 1,432,164. 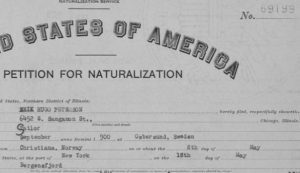 (3) “Illinois, Northern District Petitions for Naturalization, 1906-1994,” images, FamilySearch (https://familysearch.org/pal:/MM9.3.1/TH-1942-44405-52448-81?cc=2212212 : accessed 25 April 2016), Cook County > Petitions, 1941, v. 965, no. 233901-234250 > image 708 of 1079, Ludwika Smarz, P.234127; citing NARA NAID 593882, National Archives at Chicago, Illinois. (4) “Illinois, Northern District Naturalization Index, 1840-1950,” database with images,FamilySearch (https://familysearch.org/ark:/61903/1:1:XKPS-4ZK : accessed 7 April 2016), Piotr Smarz, 1924; citing Illinois, NARA microfilm publication M1285 (Washington D.C.: National Archives and Records Administration, n.d.), roll 164; FHL microfilm 1,432,164. 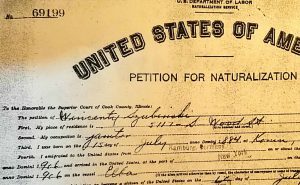 (5) “Illinois, Northern District Petitions for Naturalization, 1906-1994,” images, FamilySearch (https://familysearch.org/pal:/MM9.3.1/TH-909-55385-1161-59?cc=2212212 : accessed 25 April 2016), Cook County > Petitions, 1928, v. 326, no. 56801-57050 > image 708 of 926, John Silinskas, P.56992; citing NARA NAID 593882, National Archives at Chicago, Illinois. (7) “Illinois, Northern District Naturalization Index, 1840-1950,” database with images,FamilySearch (https://familysearch.org/ark:/61903/1:1:XKGY-HP2 : accessed 7 April 2016), Wincenty Szubinski, 1926; citing Illinois, NARA microfilm publication M1285 (Washington D.C.: National Archives and Records Administration, n.d.), roll 151; FHL microfilm 1,432,151. (8) “Illinois, Northern District Petitions for Naturalization, 1906-1994,” images, FamilySearch (https://familysearch.org/pal:/MM9.3.1/TH-909-55876-27502-14?cc=2212212 : accessed 25 April 2016), Cook County > Petitions, 1929, v. 375 no. 69051-69300 > image 575 of 963, Erik Hugo Peterson, P.69199; citing NARA NAID 593882, National Archives at Chicago, Illinois. 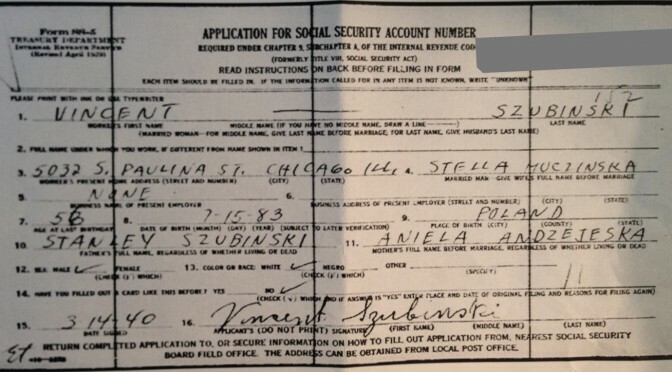 It was very exciting when I received the Form SS-5 copies of the social security applications for Vincent Szubinski and Peter Anthony Smasz. For Peter (1), the form supplied a middle name that I had never found before. The names of his parents were the same as recorded previously except for his mother’s last name. Sophia Wojcik was listed in the Form SS-5, while Sophia Blizniak was listed in Peter’s death certificate. 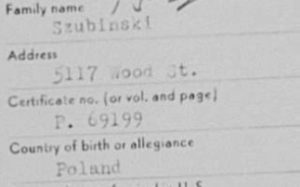 Since the Form SS-5 was completed 30 years earlier and by Peter instead of by another person, as in the death certificate, I set Wojcik as the preferred name in FTM. As I was scanning headlines earlier this week, I found one that had my half Polish heart standing up to take notice. A Grammy award winning polka song is close to becoming the Illinois state song. The Article originally appeared on the The Southern but was also carried on the Chicago Tribuine, which is where I first noticed the headline. The song version shared on the Trib was clearer, but the version shared by The Southern has a great video of Eddie Blazonczyk’s Versatones in concert. Unfortunately the State’s official dance has already been declared the square dance. Although, for a woman whose father’s family came from the farmland of Ogle County, Illinois, and whose mother’s family is south side Chicago Polish, this mix is fairly appropriate.